There are new developments daily after it was revealed recently that North Korea have ‘ratified’ a merciless attack on the U.S., potentially involving a ‘diversified nuclear strike.’ There is increasing uncertainty surrounding the intentions of North Korea’s new young leader, Kim Jong-un, and these recent threats have been levelled since the United Nations imposed sanctions in response to the North’s third nuclear weapon test in February. They are apparently also angered by on-going joint U.S. – South Korean military exercises which they see as an unnecessary show of force. North Korea, although officially a socialist republic where elections are held, has been described as a totalitarian and Stalinist dictatorship with an elaborate cult of personality around the Kim family. 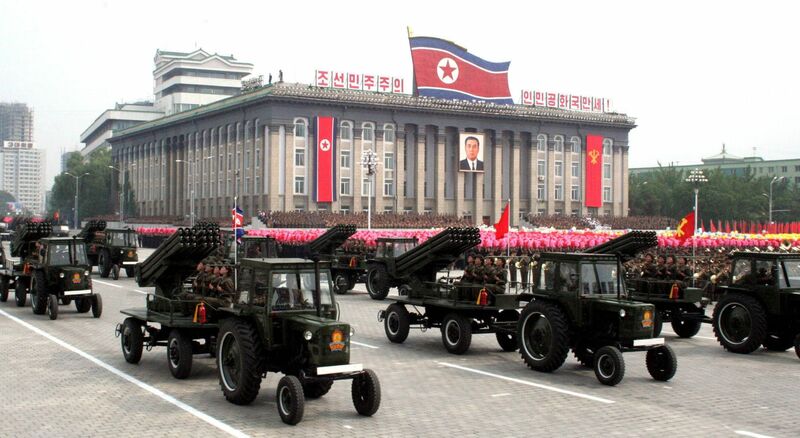 They are the world’s most militarized country with 9,495,000 active, reserve, and paramilitary personnel – this is quite extraordinary when you consider the entire North Korean population numbers approximately 24.5 million. They possess an active duty army of 1.21 million which is the fourth largest in the world after China, the United States, and India. South Korean officials have announced that the North has moved at least one missile with considerable range to its east coast – possibly the untested Musudan missile, believed to have a range of 1800 miles. U.S. officials have said the missile move suggests an imminent North Korean launch and fuels worries in the region. Analysts have said the missile could be launched this month as part of celebrations for North Korea’s most important holiday – the April 15th anniversary of the birth of the country’s founder and ‘Eternal President’ Kim Il-sung, the grandfather of Kim Jong-un. This theory is supported by the fact that the North Korean government has said it is unable to guarantee the safety of embassies and international organisations in the country in the event of conflict from April 10th onwards. So what has been the response of the world’s superpowers to the fragile situation on the Korean peninsula? First and foremost, the American response has been immediate but cautious. Two Aegis anti-missile destroyers have been sent to the western Pacific to intercept any North Korean strike against U.S./allied targets. The Pentagon has also announced it is sending an advanced ballistic missile defence system to Guam as the North ramps up its bellicose rhetoric. In order not to provoke the situation further however the Pentagon has delayed an intercontinental ballistic missile test that had been planned for mid-April at Vandenberg Air Force Base in California. The unmanned Minuteman 3 test is off until sometime next month because of concerns the launch could be misinterpreted and fears it could exacerbate the Korean crisis. China is North Korea’s closest ally, largest trade partner and primary source of aid, and yet all signs suggest that even they are losing patience with their unpredictable neighbours. In an apparent rebuke to North Korea, the Chinese have warned against “troublemaking” on its doorstep. China’s new President Xi Jinping has said that no country “should be allowed to throw a region and even the whole world into chaos for selfish gain.” North Korea no longer merits much respect among ordinary Chinese, with many insulting Kim Jong-un as ‘Fatty Kim’ or ‘Fatty the Third’ in reference to his father, Kim Jong-il, and grandfather, Kim Il-sung. One place that the U.S. and its allies are keeping a close eye on is the Punggye-ri nuclear test facility which is the alleged location where the 2006, 2009, and recent February 2013 nuclear tests took place. Satellite images have revealed activity at this site in the past – however the notorious North Korean secrecy has always made it difficult to discern their intentions, especially considering these nuclear tests were conducted underground. North Korean intentions seem increasingly suspicious at the present moment as they have severed all links they possess with the South. Pyongyang’s last shared link with South Korea was shut down recently when they refused entry to almost 500 South Korean workers who work in a cross-border industrial park. The North has also withdrawn all its workers from the joint-Korean Kaesong industrial zone and suspended operations there. This zone was established almost a decade ago and had been a symbol of co-operation between the two Koreas. Recent propaganda videos released by the North have revealed them in full preparation for all-out war. Videos include Kim Jong-un inspecting a rocket plane and firing a gun, thousands holding a mass anti-U.S. rally, and even one of military dogs and soldiers destroying effigies of South Korean defence minister Kim Kwan-Jin and a soldier in a U.S. military uniform. Russian President Vladimir Putin has commented that conflict on the Korean peninsula could cause greater devastation than the Chernobyl nuclear disaster in 1986. Without doubt a North Korean nuclear attack would cause a swift and unprecedented response from the United States and her allies. ← Adieu to Irish rugby? Au Contraire!